I nside each tooth is the pulp which provides nutrients and nerves to the tooth, it runs like a thread down through the root. When the pulp is diseased or injured, the pulp tissue dies. If you don’t remove it, your tooth gets infected and you could lose it. 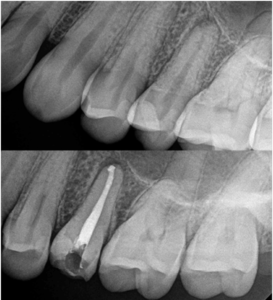 After the dentist removes the pulp, the root canal is cleaned and sealed off to protect it. Then your dentist places either a post and a composite filling or a post and crown over the tooth to help make it stronger.